If you are interested in nature, woodland, wildlife or just walking, then Glengarra Wood is an ideal place to visit during your stay at The Apple Farm. 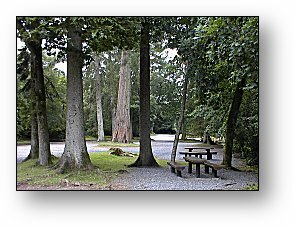 It is situated 13km west of Cahir town, beside the N8 road to Mitchelstown which is parallel to the main Dublin to Cork N8 dual carriageway. The woods extend upwards on the southern slopes of the Galtee mountains. Parts of the woodland have been developed to cater for visitors. The facilities provided include car parking, 5km of pathways, log bridges, picnic tables, and information boards providing the names of the different tree species, etc. There are many fine specimen trees, including the giant California Redwood, which were planted during the time when the area was part of the Lismore estate. In the early summer, the rhododendron flowers make a fine display. 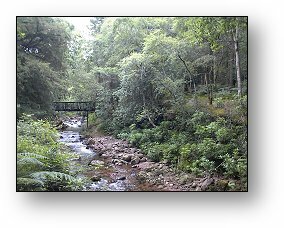 The Burncourt river flows down through the wood, although in this area it would be better described as a mountain stream which has revealed the underlying red sandstone. About 2.5km from the main road is an old hunting lodge which is now used as hostel accommodation. Glengarra Wood is approx. 20km. from The Apple Farm camping park.